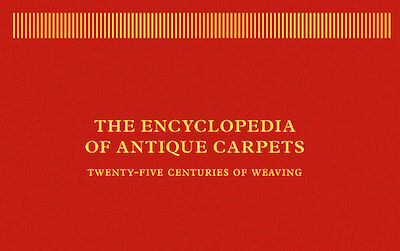 The Encyclopedia Of Antique Carpets: Twenty-Five Centuries Of Weaving is the most comprehensive reference book on the history of carpet and rug weaving. It was written by veteran carpet dealer Abraham Levi Moheban, edited by his son David Moheban, and published in two heavy volumes (A-K and L-Z) with an illustrated slipcase. The Encyclopedia features 600 entries covering global carpet production, with 850 carpets illustrated in colour. These include arguably the most famous Persian carpet, the Ardebil Safavid carpet at the V&A; and the world's most expensive carpet, another Safavid example, which was auctioned for more than $33 million in 2013. As the author writes in his preface, the Encyclopedia contains "a much larger corpus of sources and images than any other book previously published [on this subject]... There is no comparable book available and there is no prospect of another similar." The only potentially comparable work is Oriental Rugs, by Peter F Stone, though Stone's book has shorter, dictionary-style entries, and lower-resolution images. By contrast, the Encyclopedia is much more extensive (over 600 pages), and has higher-quality photographs. Oriental Rugs & Carpets: A Comprehensive Study (by Arthur Urbane Dilley) was one of the first histories of oriental rugs in English. Oriental Rugs: A Comprehensive Guide (by Murray L Eiland) is an excellent modern history of the subject. (The second edition has additional coverage of Indian rugs, and better illustrations.) A History of Textile Art (by Agnes Geijer, illustrated in black and white) and 5,000 Years Of Textiles (a definitive study, edited by Jennifer Harris) are general historical surveys of textiles.